Love the informal setting and the mostly DIY details. Love the idea of the wishes card! Gonna have to incorporate this one into my daughter’s birthday party. Thanks. omg where did you get that bow! 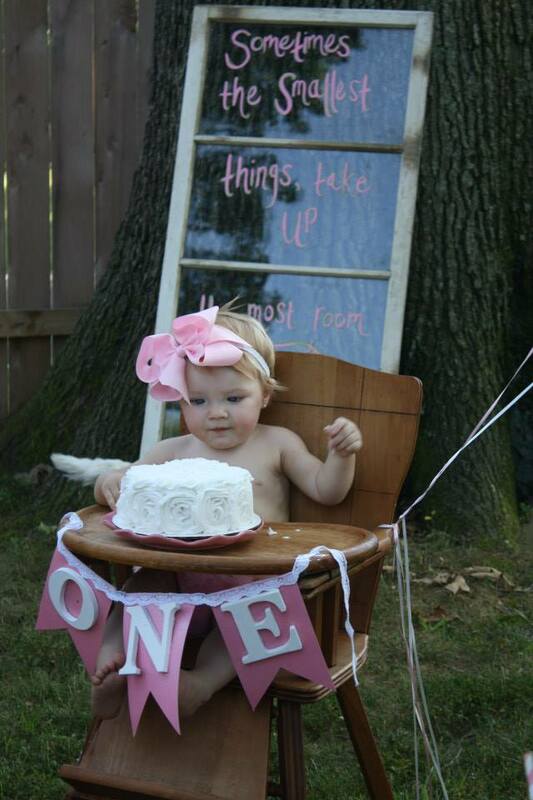 Need to know where to get her bow, please share… want for m baby’s 1st birthday!! Is there any way to find out where the bow and diaper cover came from? I am dying to know! can you please tell me where you got that beautiful pink bow? So cute! Where did you get that high chair? I am in love with it! This is so cute! Can you please tell me where you bought the bow and diaper cover? Would love to know where you bought bow? Absolutely LOVE all the details! This is so beautiful! Such an inspiration!! Where are the beautiful big bow and diaper cover from? They would be perfect for my little princess’s first birthday! I would love to know about the bow. So cute! Love all the details. where did you get her big bow!? love it! Would love to know where the cupcake tshirt and ruffle diaper cover are from. Baby Girl Pink, Blue & Green Nursery!